At last, another of the empty spots in the Charisma/B&C discography has been filled! 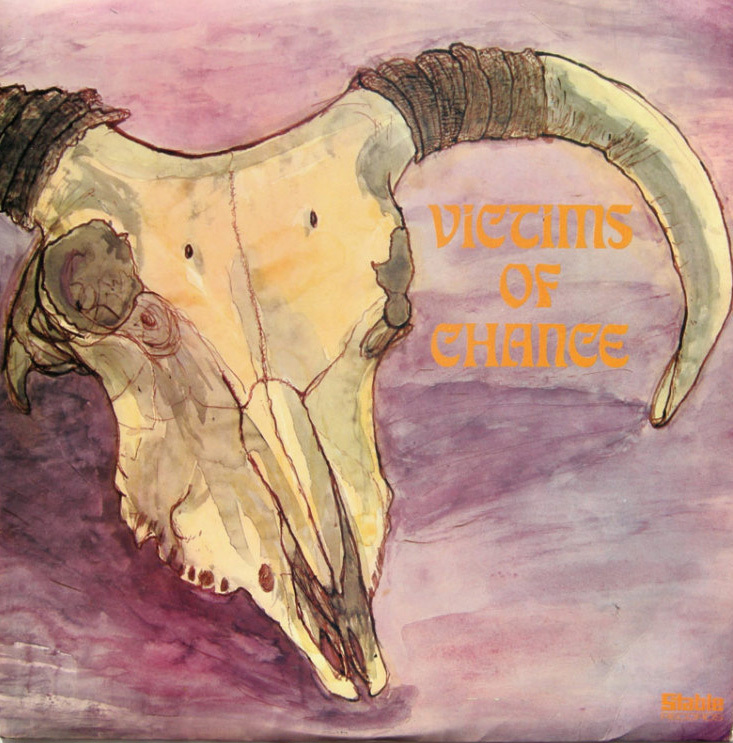 Thanks to Christoph Plitt of Karlsruhe, Germany, I can now report that the number CAS 1004 was assigned to a self-titled LP by the group Victims of Chance. The LP has "CAS 1004" in the groove runoff but was released instead as Stable Records SLE 8004. This 1969 release has the standard rough textured B&C label, though the credits and logo on the LP cover list the record company as Stable Records. 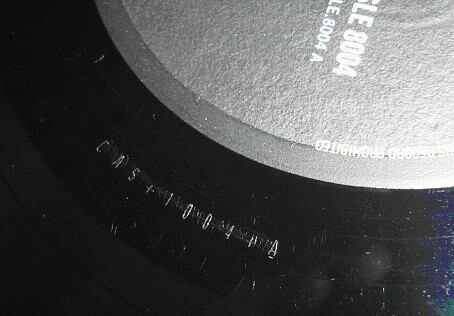 In the photo below, kindly supplied by Christoph, you can see SLE 8004 on the label and CAS 1004 in the groove runoff. Christoph reports that, as with the other such cases documented on this website, the number "CAS 1004" is imprinted on both sides of the LP but is visibly crossed out with the alternate number added. It is very difficult to photograph this (I know, I've tried!) and so I am delighted that Christoph has managed to get a picture which clearly reveals the missing CAS number. This is the fourth confirmed case of a CAS number being assigned to an LP that was ultimately released under a different label and catalogue number. The others are CAS 1008 (The Group Image), CAS 1046 (Martin Carthy & Dave Swarbrick) and CAS 1047 (Shirley Collins & the Albion Country Band). 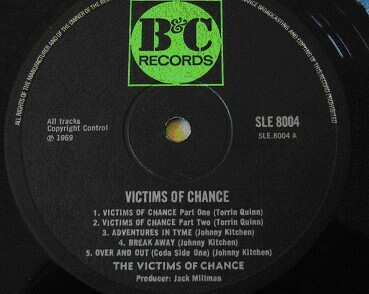 Victims of Chance was an American group featuring a man named Johnny Kitchen. Kitchen, an enigmatic figure, is believed to have been Canadian and to have been a part of the Canadian outfits Crazy People and The Blues Train. He eventually turned up in Los Angeles and was involved in the recording of the first album by onetime Frank Zappa cohort Larry "Wild Man" Fischer. The true identity of the pseudonymous Johnny Kitchen is not known. The Victims of Chance LP was recorded in late 1968/early 1969 and was released in the US on Crestview, the label also responsible for the Bob & Earl LP released by B&C (see the "Other B&C LPs" page). The music is a mix of blues, folk, prog, and psychedelia. It is interesting to note the similarities to the other instance of a CAS number ending up on the Stable Records label, The Group Image, who were also an American band with a similarly eclectic blend of influences. The moral of this story: check the inner groove runoff of any B&C-related LP! Let's find those other missing numbers! Text ©2009 Mark J. Moerman, Pictures ©2009 Christoph Plitt. Information and images on this page may not be reposted without permission and proper acknowledgement.